New Dorp is a neighborhood on the East Shore of Staten Island, New York City, United States. New Dorp is bounded by Mill Road on the southeast, Tysens Lane on the southwest, Amboy and Richmond Roads on the northwest, and Bancroft Avenue on the northeast. It is adjacent to Oakwood to the southwest, Todt Hill to the northwest, Dongan Hills and Grant City, and Midland Beach and Miller Field to the southeast. New Dorp Beach, bordering to the east, is often listed on maps as a separate neighborhood from Mill Road to the shore of Lower New York Bay, but is generally considered to be a part of New Dorp. One of the earliest European settlements in the New York City area, New Dorp was founded by Dutch settlers from the New Netherland colony, and the name is an anglicization of Nieuw Dorp meaning "New Village" in the Dutch Language. It was historically one of the most important towns on Staten Island, becoming a part of New York City in 1898 as part of the Borough of Richmond. In the 1960s New Dorp ceased to be a distinct town during New York City's suburbanization, where rapid housing development on Staten Island saw the town added to the city conurbation. Despite this, today New Dorp remains one of the main commercial and transport centers on Staten Island. New Dorp is often associated with the Vanderbilt family, who had a notable presence in the area and many of whom are buried in the neighborhood at the Moravian Cemetery, the largest and oldest active cemetery on Staten Island. New Dorp is part of Staten Island Community District 2 and its ZIP Code is 10306. New Dorp is patrolled by the 122nd Precinct of the New York City Police Department. 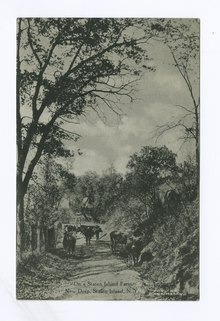 Photograph of a cows standing on a dirt path at a farm in New Dorp, reflecting the area's former agricultural character. New Dorp was the location of the first county seat of Richmond County. Called Stony Brook, it was located approximately where Amboy Road experiences a sharp bend between the New Dorp and Oakwood train stations. In 1667, at the end of the Second Anglo-Dutch War, the Dutch Republic ceded their colony of New Netherland to England as a condition of the Treaty of Breda. The colony had been occupied by the English since 1664, and was re-branded as the Province of New York when it was granted as a proprietary colony to James, Duke of York. The areas of New Netherland already settled by the Dutch included the primary settlement of New Amsterdam (now renamed New York City) located at the southern tip of Manhattan Island, and numerous additional lands around the city and along the Hudson River. This included Staaten Eylandt, later anglicized as "Staten Island", a sparsely populated island south-west of New York across Upper New York Bay. 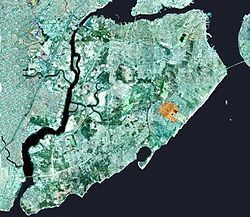 In 1670, the local Native Americans, mainly Raritans and other subgroups of the Lenape tribe, ceded all claims to Staten Island to the English in a deed to Governor Francis Lovelace. New Dorp was founded in 1671 following the English resurveying the pre-existing Dutch settlement of Oude Dorp (now Old Town) and expanded the lots along the South Shore, which were then settled primarily by Dutch families. The new lots became known as Nieuwe Dorp, (meaning "New Village" in the Dutch language) in contrast with Oude Dorp (meaning "Old Village"), and later became anglicized as New Dorp. The new village developed into one of the largest and most important settlements on Staten Island, and during the American Revolution it became a center of activity when it was occupied by British forces in preparation to attack the American-occupied New York City. The Rose and Crown Tavern in New Dorp, owned by the uncle of Cornelius Vanderbilt, temporarily served as the local British military headquarters. In the late 19th century, New Dorp became the home to members of the prominent Vanderbilt family, many of whom are buried in the Moravian Cemetery, the largest and oldest active cemetery on Staten Island. On January 1, 1898, New Dorp was consolidated as part of New York City along with the entirety of Staten Island as the Borough of Richmond. The Vanderbilt farm was later used by the U.S. Army as Miller Air Field, and in the 1970s became part of Gateway National Recreation Area. New Dorp continued to be one of the primary settlements on Staten Island until the 1960s, when the suburbanization of New York City began to expand into the island. The largely rural character of Staten Island was replaced with the massive development of suburban housing, causing separate towns such as New Dorp to be absorbed into New York City's conurbation and become one of many contiguous neighborhoods. New Dorp retained its distinct character as a town, and is one of the most thriving commercial centers on the Island which in the 1960s spread along Hylan Boulevard from New Dorp Lane and led to the construction of five shopping centers, anchored by supermarkets and department stores, with the largest being Hylan Plaza which opened in 1966. The 1960 New York mid-air collision, where 134 people were killed and held the highest death toll for a commercial aviation accident until 1968, occurred over New Dorp. For census purposes, the New York City government classifies New Dorp as part of a larger neighborhood tabulation area called New Dorp-Midland Beach. Based on data from the 2010 United States Census, the population of New Dorp-Midland Beach was 21,896, a change of 1,654 (7.6%) from the 20,242 counted in 2000. Covering an area of 1,269.49 acres (513.74 ha), the neighborhood had a population density of 17.2 inhabitants per acre (11,000/sq mi; 4,300/km2). The racial makeup of the neighborhood was 78.3% (17,136) White, 1.2% (261) African American, 0.1% (28) Native American, 5.2% (1,148) Asian, 0% (2) Pacific Islander, 0.1% (31) from other races, and 1% (215) from two or more races. Hispanic or Latino of any race were 14% (3,075) of the population. The Lane Theater in New Dorp opened on February 10, 1938, playing One Hundred Men and a Girl as its first feature film. Charles, Lewis and Elias Moses, who operated theaters on Staten Island under the name Isle Theatrical had John Eberson design an "atmospheric theater" using lighting, projecting images, and an impressive painted ceiling. The facility cost about $100,000 to build, had seating for 600 people, the latest RCA sound system, and was cooled by refrigeration. The structure was remodeled in 1977 with a new seating capacity of 550. In 1988 a landmark designation report was submitted describing the Lane Theater as "one of the last surviving pre-World War II movie theater interiors on Staten Island, and one of the few known largely intact examples of the Depression-era, Art Moderne style theater interior in New York City." The theater's interior has been Landmarked since November 1988. Starting in 1998, several concerts were hosted including one by a young Eminem. "The EleMent" nightclub opened and eventually closed in 2001. In the summer of 2009 renovations were performed and Uncle Vinnies Comedy Club opened. The club closed in April 2011. In 2012 the building became the home of the Crossroads Church. The 122nd Precinct has a lower crime rate than in the 1990s, with crimes across all categories having decreased by 91% between 1990 and 2018. The precinct saw 0 murders, 12 rapes, 43 robberies, 109 felony assaults, 89 burglaries, 315 grand larcenies, and 47 grand larcenies auto in 2018. New Dorp is served by the New York City Fire Department (FDNY)'s Engine Co. 165/Ladder Co. 85, located at 3067 Richmond Road. Engine Co. 165 is the only Engine Company in Staten Island that has clothing to deal with hazardous materials, and it also has extra hazmat training. The nearest major hospital is Staten Island University Hospital in South Beach. New Dorp is located within the ZIP Code 10306. The United States Postal Service operates the New Dorp Station post office at 2562 Hylan Boulevard. Dugan Park is a large park in New Dorp, named after Gerard P. Dugan when it was renovated in 1974. The park is often referred to as "Tysens Park" due to the park's location on an intersection of Tysens Lane. The accompanying Tysens Park Apartments, a large housing complex, stands across the street from the park. The park is usually crowded with people from nearby schools as well as people from the apartments nearby. The park contains a large field with 2 baseball/soft fields where leagues come play almost every weekend during the summer. There are 2 basketball courts, handball courts and jungle gyms. New Dorp and Mid-Island generally have a similar rate of college-educated residents to the rest of the city. While 40% of residents age 25 and older have a college education or higher, 11% have less than a high school education and 49% are high school graduates or have some college education. By contrast, 39% of Staten Island residents and 43% of city residents have a college education or higher. :6 The percentage of New Dorp and Mid-Island students excelling in math rose from 49% in 2000 to 65% in 2011, though reading achievement declined from 55% to 52% during the same time period. The New York Public Library (NYPL)'s New Dorp branch is located at 309 New Dorp Lane. The one-story branch opened in 1907 as the New Dorp Community Library. While the NYPL started providing books to the New Dorp branch through its Bookmobile program in 1909, the branch did not become an NYPL branch until 1926. The branch was renovated in 2000. New Dorp is served by the Staten Island Railway's New Dorp station at New Dorp Lane and New Dorp Plaza. New Dorp is also served by numerous express and local bus routes. This includes the S57, S74, S76, S78, S84 and S86 local buses, the S79 Select Bus Service bus, and the SIM1, SIM5, SIM6, SIM7, SIM9, SIM10 and SIM11 express buses. Nathaniel Lord Britton, botanist and first director of the New York Botanical Garden, born in New Dorp. The Britton Cottage, a 17th Century house owned by Britton, is preserved at nearby Historic Richmond Town. Gustav A. Mayer, confectioner and the inventor of the Nilla wafer, lived in a mansion in New Dorp on St. Stephens Pl. Jacques Reich, portrait etcher, lived in New Dorp. Eddie Kaye Thomas, actor, lived in New Dorp growing up. George Washington Vanderbilt II, born in New Dorp, a descendant of Cornelius "Commodore" Vanderbilt who in 1836 began purchasing farmland in New Dorp and owned most of what became Miller Field by 1843; George Vanderbilt II became owner of the property in 1885, and used the "White House"  on the land as an occasional residence until his death in 1914. The 1983 movie Easy Money starring Rodney Dangerfield is set in New Dorp. The neighborhood is referenced in both the title and lyrics of the 2014 song "New Dorp. New York." by SBTRKT ft. Ezra Koenig. ^ a b c d "New Dorp neighborhood in New York". Retrieved March 18, 2019. ^ a b c d e f g h i j k l m n o "South Beach and Willowbrook (Including Bloomfield, Midland Beach, New Springville, South Beach, Todt Hill, Travis-Chelsea and Willowbrook)" (PDF). nyc.gov. NYC Health. 2018. Retrieved March 2, 2019. ^ "NYC-Staten Island Community District 2--New Springville & South Beach PUMA, NY". Retrieved July 17, 2018. ^ Lundrigan, Margaret (2004). Staten Island : Isle of the Bay. Arcadia Publishing. p. 118. ISBN 0-7385-2443-3. Retrieved January 27, 2019. ^ Gray, Christopher (September 25, 1988). "STREETSCAPES: The Lane Theater; In a 1930's Movie Palace, the Stars Still Come Out". New York Times. New York Times. Retrieved January 27, 2019. ^ "Lane Theater in Staten Island, NY". Cinema Treasure. Cinema Treasures, LLC. Retrieved January 27, 2019. ^ "Landmarks Preservation Commission, LP-1696, Lane Theater" (PDF). NYC.gov. City of New York. November 1, 1988. Retrieved January 27, 2019. ^ Green, Matt. "The Lane on the Lane". Flickr.com. Retrieved January 27, 2019. ^ Walsh, Kevin (May 31, 2010). "GRANT CITY/NEW DORP, Staten Island". Forgotten New York. Forgotten New York. Retrieved January 27, 2019. ^ "Want a piece of the old Lane Theater? It's yours for $995". SILive.com. Staten Island Advance. 2015. Retrieved January 27, 2019. ^ "NYPD – 122nd Precinct". www.nyc.gov. New York City Police Department. Retrieved October 3, 2016. ^ "New Dorp & South Beach – DNAinfo.com Crime and Safety Report". www.dnainfo.com. Retrieved October 6, 2016. ^ "122nd Precinct CompStat Report" (PDF). www.nyc.gov. New York City Police Department. Retrieved July 22, 2018. ^ "Engine Company 165/Ladder Company 85". FDNYtrucks.com. Retrieved March 14, 2019. ^ "Best 30 Hospitals in Staten Island, NY with Reviews". Yellow Pages. December 1, 2009. Retrieved March 19, 2019. ^ "South Beach, New York City-Staten Island, New York Zip Code Boundary Map (NY)". United States Zip Code Boundary Map (USA). Retrieved March 19, 2019. ^ "Location Details: New Dorp". USPS.com. Retrieved March 7, 2019. ^ "South Beach / Willowbrook – SI 02" (PDF). Furman Center for Real Estate and Urban Policy. 2011. Retrieved October 5, 2016. ^ "New Dorp New York School Ratings and Reviews". Zillow. Retrieved March 17, 2019. ^ "The Stephanie A. Vierno School". New York City Department of Education. December 19, 2018. Retrieved March 19, 2019. ^ "New Dorp High School". New York City Department of Education. December 19, 2018. Retrieved March 19, 2019. ^ "Staten Island Technical High School". New York City Department of Education. December 19, 2018. Retrieved March 19, 2019. ^ "About the New Dorp Library". The New York Public Library. Retrieved March 14, 2019. ^ Vecsey, Laura (June 30, 2014). "Staten Island Villa Was Home to Nabisco 'Nilla' Wafer Inventor". Zillow.com. Zillow Porchlight. Retrieved January 21, 2019. ^ Keil, Jennifer Gould; Rosenbaum, Sophia (February 26, 2015). "'Haunted' Staten Island mansion can be yours for $2 million". NewYorkPost.com. New York Post. Retrieved January 21, 2019. ^ "File:Vanderbilt Mansion Staten Island1.jpg". Wikimedia.org. Library of Congress. Retrieved January 22, 2019. ^ "Lake and Mansion, Vanderbilt Estate, Miller Field, Staten Island, N.Y." New York Public Library Digital Collections. New York Public Library. Retrieved January 21, 2019. ^ Sherry, Virginia N. (December 31, 2012). "New life for historic, vacant aircraft hangar on Miller Field?". SILive.com. Staten Island Advance. Retrieved January 19, 2019. ^ "A Detailed History of Miller Field". Gateway National Recreation Area NY NJ. National Park Service (NPS). February 26, 2015. Retrieved January 19, 2019.